Farmhouse charm, modern amenities. Cozy enough for 2, large enough for 6. Looking for a peaceful getaway tucked in the Blue Ridge Mountains? Look no further than the peace and quiet of the Parkway Farmhouse! The Farmhouse is a new home located in the Blue Ridge Mountains of Ashe and Wilkes Counties, North Carolina, less than a mile from the Blue Ridge Parkway and the Mountains-to-Sea-Trail and minutes from the towns of Glendale Springs and West Jefferson, and 30 minutes from N. Wilkesboro, Boone and Blowing Rock. Cozy enough for two, but large enough to sleep 6, this home has 3 bedrooms (2 queens, and 2 twins) and 2.5 baths. 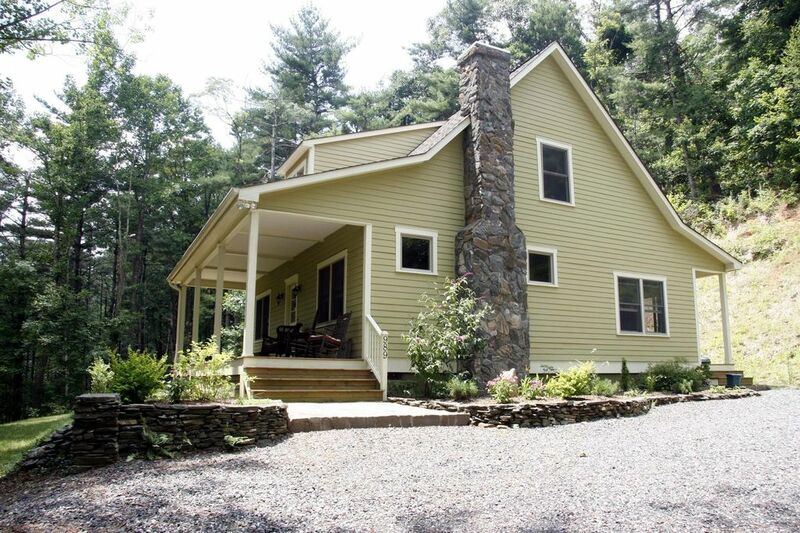 The Parkway Farmhouse has the charm of a mountain farmhouse with modern amenities. Built with quality craftsmanship and attention to detail, the Farmhouse has a sweeping front porch, stunning hardwood floors, 10' ceilings, ceiling fans, stacked stone gas fireplace, custom wainscoting, vaulted foyer and accent lighting. Beautifully furnished and decorated with many touches from local artists including paintings, pottery, lamps and soaps. The Farmhouse features a fully stocked kitchen with cherry cabinets and granite countertops. The first floor master and master bath has custom tile, granite counters and a Jacuzzi tub. The private, wooded lot is landscaped and has an outdoor fire pit and grill. Walk out the front door to the creek with small waterfalls or catch the Mountains-to-Sea-Trail (MST) which cross crosses the Parkway to mountain overlooks. Take the Parkway to breakfast or lunch in Glendale Springs and visit the Church of the Frescoes. Dine at the River House or the quaint mountain town of West Jefferson. Float down the 'New', fish for trout, bike the Virginia Creeper Trail, or just sit on the front porch and watch the deer cross the yard and the birds on the feeder. Whatever your definition of a good time, you'll find it at the Parkway Farmhouse. There's always something happening in the high country and the Farmhouse is ideally located to enjoy a vacation year round. In the Summer float the New River or bike the Virginia Creeper Trail. In the Fall, pumpkins patches, corn mazes and apple picking provide plenty of family fun! Thanksgiving brings the opening of the Ashe County Choose & Cut Tree Farms with hay rides, hot chocolate and more fun for the family! The Farmhouse is surrounded by parks including Mount Jefferson State Park, New River State Park, Doughton Park, Stone Mountain State Park, Grayson Highlands State Park, to name a few. Whether you enjoy riding horses, bicycling, hiking, canoeing, fishing, shopping, dining or just plain relaxing, consider the Parkway Farmhouse for your next getaway. Originally from California, made a career move to North Carolina over 15 years ago and immediately fell in love with this beautiful State and it's people. I work in the legal technology industry and my husband is an aerial photographer. Though we live in the city, we are lucky to have enough room for four rescue dogs, a cat and organic garden. We enjoy our city life but escape often to the mountains to unwind and relax. We decided to buy our mountain farmhouse because with our busy schedules and the dogs, we didn't get to travel as much as we liked. We decided to buy something we could easily get to and escape our everyday lives. We had vacationed often in and around West Jefferson and were already in enamored with the area. We fell in love with the 'farmhouse' the moment we stepped foot on the long front porch and were embraced by the cool breezes and peace and quiet of the mountains. The Parkway Farmhouse has the charm of a mountain farmhouse with modern amenities. A sweeping front porch, cathedral entry, 9 foot ceilings, stacked rock gas fireplace and hardwood floors. The Farmhouse is a beautifully furnished and decorated home with many touches from local artists including art, pottery, lamps and soaps. The Farmhouse is located less than a mile off the breathtaking Blue Ridge Parkway. Walk out the front door and hike to stunning waterfalls or mountain vistas. Take the Parkway to breakfast or lunch in Glendale Springs or the Historic Lodge in Doughton State Park. Dine at the River House or the quaint mountain town of West Jefferson. Float down the 'New', fish for trout, bike the Virginia Creeper Trail, or just sit on the front porch and watch the deer cross the yard and the birds on the feeder. Whatever your definition of a good time, you'll find it at the Parkway Farmhouse. Many excellent courses in the area. Complete Kitchen with all new appliances, granite counter tops, with everything you need to prepare gourmet meals or a quick snack. Pet Friendly (pet waste must be removed from the property). 32' HD TV, with HD DVD player. EVERYTHING you have at your own home is here! Lovely, charming, and thoughtfully appointed home in a secluded - beautiful setting. Our intent was to couple a work assignment I had with a winter get-away from our Wisconsin winter. Our stay was peaceful, the surrounding area is beautiful with hiking right out the front door. The falls and many day trips were a fun escape from the subzero temps and car top high snow drifts in our driveway back in Wisconsin. We loved it. The day trips to Boone, Bristol, West Jefferson, Wilksburo and Asheville and many places in between were just great. If your looking to get away from it all, like to hike - even a little - and want to explore this part of North Carolina, this is a superb VRBO. Ellen's home was so beautiful and it was the perfect getaway to spend Christmas. She had everything you could need and things you did not even think you needed. Would definitely stay here again and recommend this home to anyone. Thank you, Ashley! So glad you enjoyed your stay! Please do visit again. This house was wonderful! We've stayed in many VRBO homes and while they were nice I was always ready to go home. That was not the case with the Parkway Farmhouse! If our schedules would have allowed it, we would have stayed extra nights. The house is very nicely decorated. Beautiful local artwork can be found throughout the home. The beds and linens were comfy and clean. Bathrooms had plenty of soft towels and special Parkway Farmhouse soap. The kitchen has everything you would need to make a large dinner. There are also plenty of good plates and lots of silverware and cooking utensils. The living room sofa and chairs offer a nice spot to relax after hiking in the mountains. Also, there is a nice fire pit outside to warm up around in the evenings. There are lots of board games and movies available. The yard has a really nice flat spot which was perfect for throwing the football or kicking the soccer ball. Our dogs enjoyed the yard and the hiking as well. The abandoned road up above the house is a very nice walk. The road leading past the home is also a very nice walk with some creek views a little ways past the farmhouse. The mountain to seas trail is right up the parkway and offers a lot of good hiking. We ate at the Glendale Springs Inn & Restaurant and found it to be wonderful. Very nice menu and setting. I had the Mahi Mahi with roasted corn chowder and my husband had the Prime Rib. The edamame hummus was so delicious I could have ordered a second plate! More of a restaurant for adults but they were very accommodating for my 8 year old. They don't have a kids menu but were able to offer chicken tenders, cheeseburger and pasta. The town of West Jefferson is a perfect mountain town. Cute shops and restaurants line both sides of the street. Ashe cheese factory is at the end of the street. You can watch the cheese being made and purchase fresh cheese at the store across the street. Overall, we had a lovely time staying at the Parkway Farmhouse. You can tell the owners love this home and we did too! Parkway Farmhouse was a perfect fit for my husband, myself, our two friends, and our little Cavapoos. The bungalow abounds with artistic touches, comfortable furniture and appealing decor. Since we love to cook, we were pleased with the very well-equipped kitchen. Outside, we enjoyed walking some of the miles of lanes around the serene mountain setting. It was a little too chilly to sit in the rockers on the frontporch for long, but we look forward to returning for that in the summer. Oh yes! As the house's name implies, we were minutes off the Blueridge Parkway and stunning overlooks. Great spot for our family to spend sometime together. Great floor plan and beautifully furnished and appointed. Took parkway into Blowing Rock. Best way to go and a beautiful drive. West Jefferson, Blue Ridge Mountains, North Carolina, USA -- The Parkway Farmhouse is the perfect place for you. The farmhouse is a brand new home located in the Blue Ridge Mountains of Ashe and Wilkes Counties, North Carolina, less than a mile from the Blue Ridge Parkway and the Mountains-to-Sea Trail and minutes from the towns of Glendale Springs and West Jefferson, less than 30 minutes from the Boone and Blowing Rock area. The Farmhouse is surrounded by parks including Mount Jefferson State Park, New River State Park, Doughton Park, Stone Mtn. State Park, Grayson Highlands State Park, to name a few. There's always something happening in the high country and the farmhouse is ideally located to enjoy a vacation year round. If you need assistance planning your activities, we partner with Mountain Guest Services, staffed by long time residents of the High Country who can arrange activities, restaurants and services that only the 'locals' know about. .